I used the Cricut markers on the skull...and hate it! But nothing I can do about it now. I think it had something to do with the paper, it absorbed the ink a little too well! I wasn't using Prism cardstock, that is for sure! The file is set to cut 6 at a time and was designed on a 12x12 mat. On the skull mat you will want to put your white on the left hand side row of skulls and the black on the right. I hid some of the contours so I could have the black in the eyes and nose since I didn't see a feature like that on the cart. 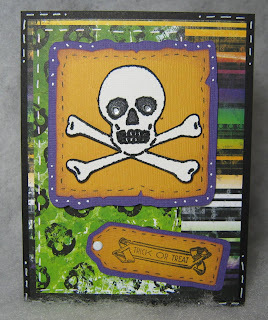 Oh the sentiment mat will actually work with several of the Studio G Halloween stamps!